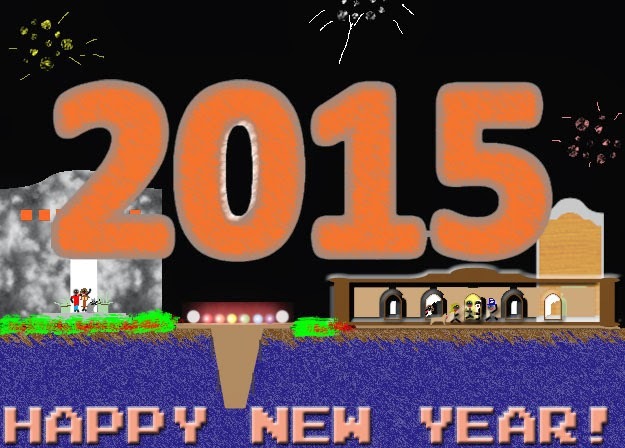 We are entering 2015 around the world today. Happy New Year! S = speed of observer relative to the source, stored in m/s. S<0 if the source and observer are getting closer. S>0 when the source and observer are moving apart. An observer is moving towards emitting a sound of 261.6 Hz (Middle C) at about 1.05 mph. Input velocity as -1.05. Enter two points as complex numbers (x+y*i). The complex value i is accessed by pressing [2nd] [ 3 ]. Direction is important, P is your starting point and Q is your finishing point. Find an equation for the points, going from (2,5) to (4,6). Find an equation for the points, going from (7,3) to (9,-1). We will use a trick with the function variable to pull this integral off. ** Caution: This will provide an approximate answer. Best use four to five digits at most. Note: Enter Y1 by pressing [VARS], [ right ] for Y-VARS, [ 1 ] for Function, [ 1 ] for Y1. Example: Find the arc length of the function y = e^(-x^2/2) from x = 0 to x = 3. The Mass of the Sun is 4.384 x 10^30 pounds. This blog is property of Edward Shore. 2014. Today, December 21, 2014, is the December Solstice. In the Northern Hemisphere, it is the first day of winter. In the Southern Hemisphere, it is the first day of summer. As someone who lives in California, I must admit I feel a little jealous of all of you enjoying the long day living around our Tropic of Capricorn, I love the sunshine. I want to wish everyone a Happy, Healthy, Safe, and Celebratory Solstice, and Happy Holidays (Christmas, Hanukkah, and all the holidays that are being celebrated worldwide). I thank everyone who follows this blog, comments, and readers. Thank you for making this blog the success that it is. I'll probably speak to you next week - until then, CHEERS! You can see the blog entry about the Moore-Penrose inverse here: http://edspi31415.blogspot.com/2014/08/moore-penrose-inverse-of-matrix.html. On the LSQ (Least Squares Solution Command) function, featured on both the HP Prime and HP 50G, you can find A^+. Where IDENMAT is the identity matrix command. Each column has 5 of 15 possible numbers, except the N column, which only has 4. The N column has a Free Space. How Many Different Bingo Cards Are There? A bingo card has five rows, five columns , and two diagonals. The middle row, middle column, and the two diagonals contain the Free Space. Note: nPr is the Permutation function n!/(n-r)!, sometimes labeled PERM or (n r) shown vertically. 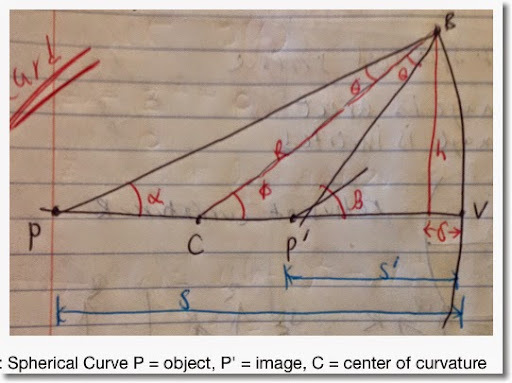 Simply put, permutation means arrangement: "How many ways can we arrange r out of n objects? We can get the number of different cards by using rows as well. We arrived at the same destination. What The Odds of Having a Winning Card in Bingo? Even though there are 2,0711,126,800 ways to pick 5 numbers out of 75; thus making you very lucky to get a Bingo if the you win after just five draws. Despite this, we look at the number of cards that are played in the game rather than the numbers themselves when answering this question. This is true if you are playing BINGO by a line or blackout bingo. Have a great day! Now I am off to errands and maybe wrap some presents. Google dedicated their home page to Annie Jump Cannon today. The Henry Draper Award winner classified and observed 500,000 stars, while breaking ground for women in science. She also has a crater named after her on our Moon, and her stellar classification is standard (as determined by the IAU). Δt = 1/√(1 - 29.0756^2/299,792,458^2) ≈ 1.0000000000000047 (that is fourteen zeroes between the decimal point and the 4) (The Wolfram Alpha app was used for this calculation). Virtually the same time passes. Same deal regarding observing an airplane flying at 600 mph (268.224 m/s). For the person watching the plane, for a plane's passenger, pilot, or cocktail and peanut server to observe one unit of time, us watchers observe 1.0000000000004 (twelve zeroes) units of time. If you want to be on an object where the people observing you experience twice the time (Δt = 2) you do (Δt0 = 1), you will need to travel (c*√3)/2 or 259,627,884.491 m/s (580,771,037.247 mph). That is 86% the speed of light! In archery, archers aim their arrows slightly to the side, instead of directly at the target. On the surface, that seems crazy. This is where the Archer's Paradox comes into effect. Basically, when the arrow is shot, it travels in an "S" curve. Drawing a string makes the arrow bend such that he tip is pointed away from the target. As the arrow is fired and the string returns to the bow, the arrow bends the other way, turning the arrow back to the target. * The center is our sun. * The coordinates are (l°, b°), where l is the longitude (0° to 360°, flat angle) and the latitude (-90° to 90°, height). * Pointing "due east", l = 0° and b = 0° is pointing towards the center of the Milky Way. "Due west", l = 180° and b = 0° points away from the center of the Galaxy. Surprisingly, the object is far from the vertex. Forgive me if I repeat things. Instead of going out to clobber everyone last Black Friday for that extra 10% off, I stayed home and cracked open some books that I have been meaning to look at for months. I hope you find this enjoyable and insightful. P.S. I was thinking about adding a section (or blog entry) about the age of Aquarius and some of the head scratchers I have about it. I am not sure if this subject would be appropriate for this blog. If you have any thoughts about this, or anything else, go and ahead and comment! - E.S. Find the distance between Sagittarius A* (center of the Milky Way Galaxy) and the Andromeda Galaxy (M31). The distance between Sagittarius A* and the Andromeda Galaxy is about 2.583 million light years. Happy Thanksgiving, or Day of Thanks, wherever you are. Please be safe and use good judgement. We need all the positive we can get on Earth, and in the cosmos. Cheers! 1. A contour curve f = y(x). This is where you get your end points. 2. We need f(z) to integrate. Separate f(z) into its parametric parts. 1. Contour: y = x + 1 from (3,4) to (4,5). Integrate ∫ z^2 dz. 2. Contour: y = x^2 - 1 from (0, -1) to (2, 1). Integrate ∫ z^2 + 1 dz. This is the basics of line integrals. Source: Wunsch, A. David. 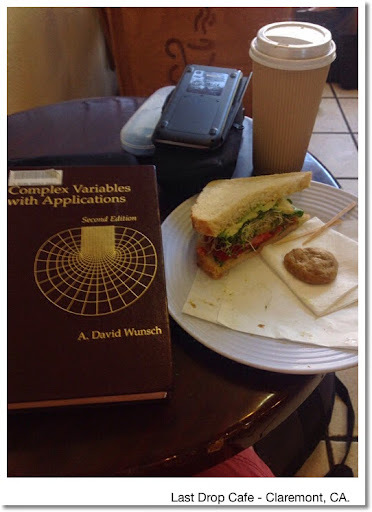 Complex Variables with Applications. 2nd Edition. Addison-Wesley Publishing Company. 1994.
f(z) = u(x,y) + i*v(x,y) where u(x,y) = Re(f(z)) and v(x,y) = Im(f(z)). 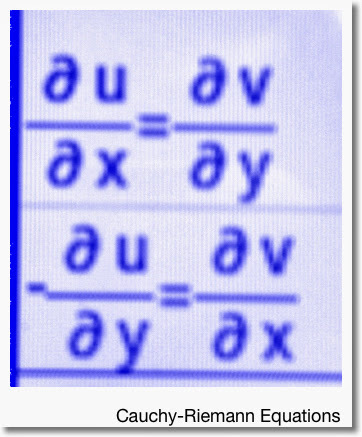 The Cauchy-Riemann equations can be used to determine whether f(z) is differentiable and if so, where. I used (I), but using (II) will garner the same result. That is the Cauchy-Riemann equations in a nutshell! Blogging today from Last Drop Cafè in Claremont, CA. I think I found a new favorite drink: mint mocha made with soy milk. Here are some basics of the conjugate and modulus of complex numbers. Usually labeled "z-bar" (z with a line over it), the conjugate is also labeled conj(z) and z*. Let's explore some properties of the conjugate and modulus. In Darts, players throw darts at circular board. The closer you are to the center of the circle, the more points you score. Hitting the center of the circle (or close to it) scores you the bulls-eye. Today we will develop formulas that determine the chance of landing a dart in a specific scoring zone. For this, we will assume that all the darts thrown will land in a specific area. The dart that hits the cat who are unfortunate to be in its path don’t count. (I) Bulls-eye circle with radius R1. Obviously, this area has the most points. (II) Green scoring area, a circular ring with outer radius R2 and inner radius R1. This area is second best in points to the bulls-eye. (III) Yellow scoring area, a circular ring with outer radius R3 and inner radius R2. A dart that lands outside any of the scoring areas scores no points. 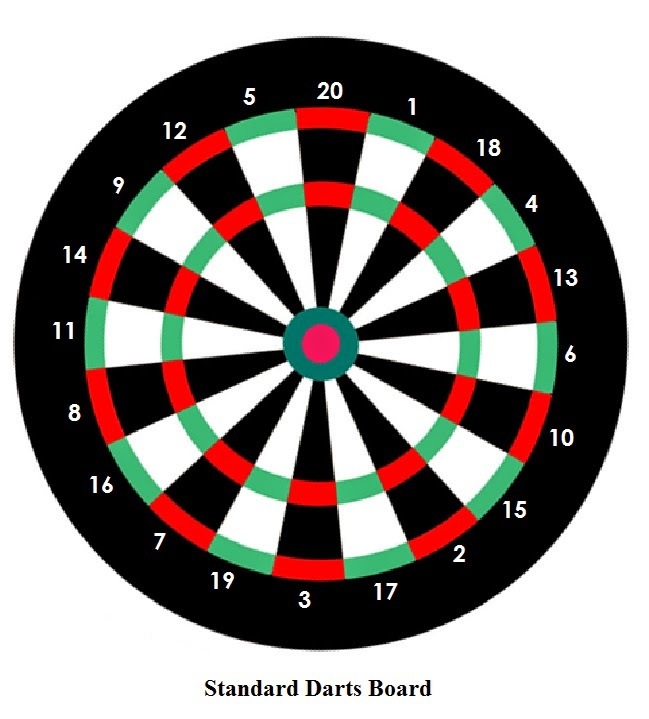 This assumes that the dart board is flat and each point of the dart board has an equal random chance. Note that these probability formulas do not take into account the skill of the dart thrower. (I) Inner Bulls-eye. 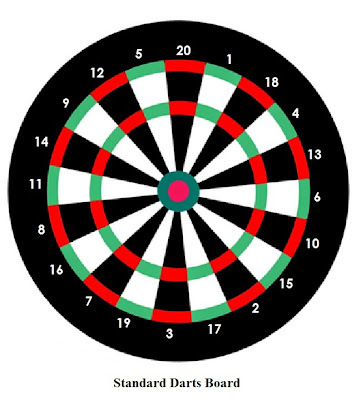 In the standard game, the inner bulls-eye is 50 points. It is a circular area, with radius R1. (II) Outer Bulls-eye – worth 25 points. It is a circular ring, with outer radius R2 and inner radius R1. (III) Inner Single Ring. 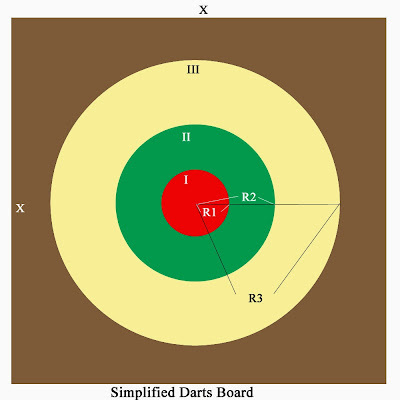 From here on out, the board is divided into 20 zones, with each zone assigned a different amount of points from 1 to 20 (not shown on the diagram). Here I am only concerned with the circular ring in general. This ring has the outer radius of R3 and inner radius of R2. (IV) Triple Ring. Each of the zones in the triple ring are worth triple the points of designated zone. 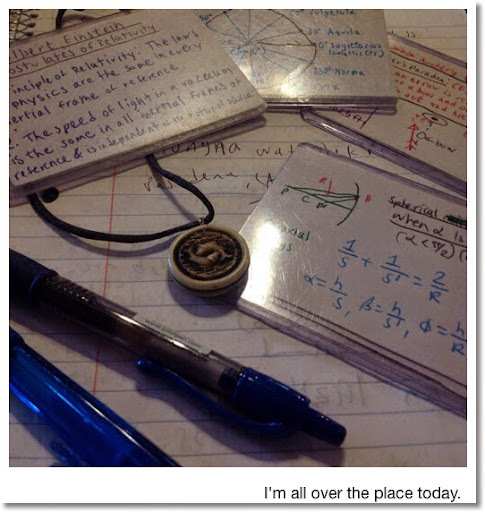 Let’s assign the outer radius of the triple ring R4 and inner radius, R3. (V) Outer Single Ring. With outer radius R5, and inner radius R6. (VI) Double Ring. Each of the zones in the double ring are worth double the points. This ring has the outer radius R6 and inner radius R5. Here, I am concerned about hitting the general scoring areas. 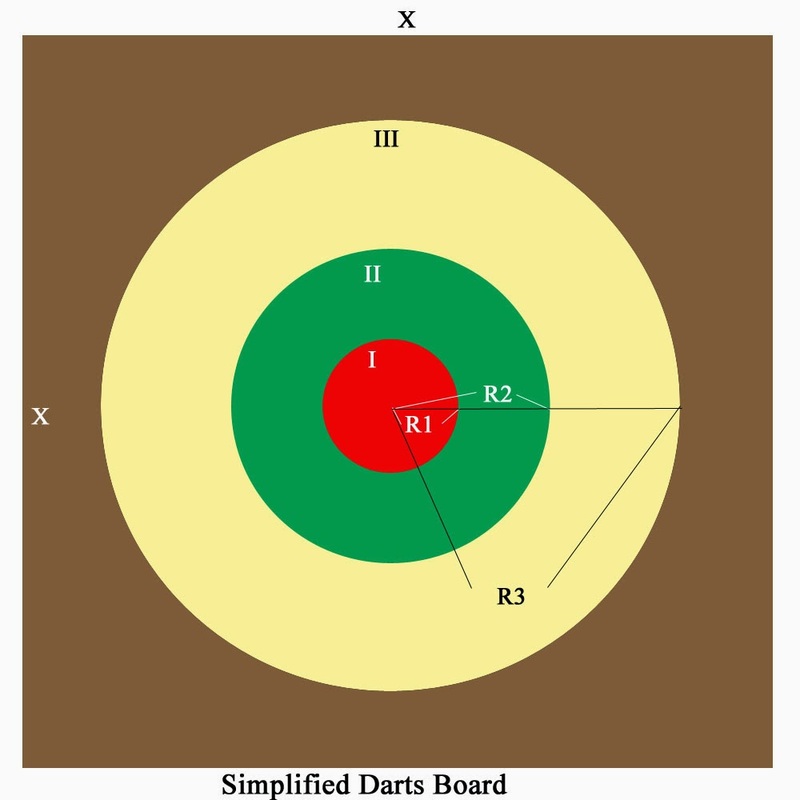 Knowing the area of the circular ring is key to calculating probabilities of hitting areas of the dart board. This entry is property of Edward Shore. 2014.